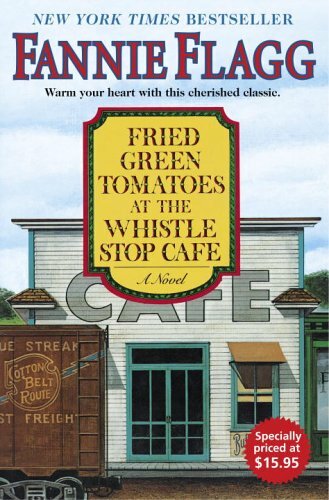 folksy and fresh, endearing and affecting, fried green tomatoes at the whistle stop cafe is the now-classic novel of two women in the 1980s: of gray-headed mrs. threadgoode telling her story to evelyn, who is in the sad slump of middle age. the tale she tells is also of two women -- of the irrepressibly daredevilish tomboy idgie and her friend ruth -- who back in the thirties ran a little place in whistle stop, alabama, a southern kind of cate wobegon offering good barbecue and good coffee and all kinds of love and laughter, even an occasional murder. and as the past unfold, the present -- for evelyn and for us -- will never be quite the same again. . . .
your novel was a gem that i never sought out. it never occurred to me to read. i don't even think i thought of it much. ever. sure, i've heard of the movie, but i've never seen it. yet your novel randomly ended up in my hands, compliments of a lady with excellent reading taste. she did not fail with this book, nor did you. mostly, i wanted to be hanging out with mrs. threadgoode. or, sitting at one of the tables at whistle stop cafe with ruth or idgie. oh, and dot weems's newsletter -- a wonderful little bonus to the story. i adore her and wilbur. these characters were ones i'd want to come home to. i'd want to have dinner with and spend my afternoons on the porch listening to their tall tales. i wanted them to enfold me in a hug in the warm summer southern sunshine. i recommend this book, and a nice glass of old-fashion lemonade to wash it down with. a delightful way to pass the afternoon.